Hussein Nasser: NO JAILBREAK FOR YOU!!! Looks like Hackers is pointing their rifles at Apple away from Microsoft. 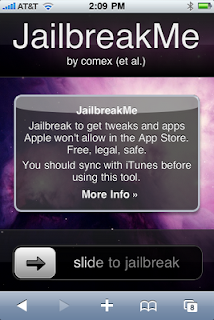 Apple releases iOS 4, while Jobs busy wrestling users for the IPhone4 Antenna problem, weeks later a Zero Day flaw in the CFF font get exploited and viola JailBreakme.com was born. A week later Apple annonces that it is releasing a patch for this flaw. The flaw is basically as follows, you visit a website and this website can execute malicious code in your phone. Now the flaw documentation is public hackers will be utilizing it.